Go Fish and Slim Down! Studies show pescetarians are about 20 pounds lighter than meat-eaters. Why? In part, it’s thanks to the satiating, appetite-quelling effects of fish protein (compared to all the fat and calories of burgers, bacon, sausage and other meat products). What’s also at work: the pound-paring effects of fruits and vegetables, a mainstay of pescetarian cuisines like the Mediterranean diet. That’s why I gave The Pescetarian Plan a Mediterranean spin. Plus, I include four calorie-controlled plans: 1,500, 1,800, 2,100 or 2,500 calories per day. 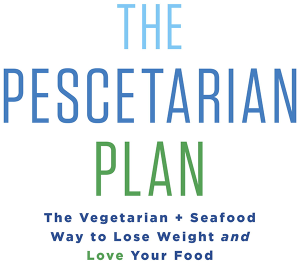 The Pescetarian Plan stacks the deck with meals that help you feel full and satisfied so it’s easier to lose weight. Plus, this is exactly the type of plan that helps keep weight off over the long haul. That’s because you learn a slimming way of eating—it’s not a diet you go “on” or “off” of.